One last time! After 25 years, T-Boz and Chilli, will release a final album as TLC. The two remaining members of the hip-hop group created a Kickstarter campaign on Monday, Jan. 19, to fund the upcoming project. Tionne "T-Boz" Watkins and Rozonda "Chilli" Thomas asked fans for $150,000 to back a fifth and final studio album. "We want to do one last TLC album," T-Boz, 44, said in a video to fans. "We want to do an album but we want to do it on our own." "We want to be able to be creative, think outside the box, and just be free to do what we really want to do," Chilli, 43, chimed in. "We want to give you guys the quality of work that we have always given you." In less than a week, the musicians met and exceeded their goal, counting $173,390 in contributions as of Thursday, Jan. 22. The funds came from followers and supporters, including one very famous face. "A BIG Special THANK YOU 2 @katyperry for her pledge to our #Kickstarter Campaign!" T-Boz tweeted on Tuesday, Jan. 20. "Your awesome!" "Wow @katyperry..." added Chilli of the star, who reportedly gave $5,000 to the fundraiser. "Thanks so much for pledging!" Perry's contribution gave her access to a choice of three incentives at the $5,000 level: a onesie from TLC's fashion archives, a slumber party in Atlanta with Chilli, or a slumber party in Los Angeles with T-Boz. As the onesie and the sleepover with Chilli were unclaimed as of Thursday morning, the "Roar" singer, 30, may have planned a little "California Gurls" get-together with T-Boz. The upcoming project will be TLC's first studio album since the untimely death of founding member Lisa "Left Eye" Lopes. The star died in a car accident at the age of 30 in April 2002, after recording tracks for the group's last album, November 2002's 3D. In the years since, T-Boz and Chilli have performed sporadically as TLC and released compilation albums with past recordings, but have yet to debut a record of new music without Left Eye. The season of crop tops, floral headbands, henna tattoos, and port potties is among us people which can only mean one thing. Coachella baby! The official 2015 festival headliners were announced via twitter this morning and we’ve got all the details. AC/DC will be kicking the festivities off on April 10th as well as the 17th, Jack White will be performing on April 11th and the 18th, and Drizzy Drake will be the closing headliner on April 12th and the 19th. AC/DC, Jack White, and Drake?? Yes please. Amongst a slew of other performers, Florence and the Machine, David Guetta, The Weekend, and Hozier will also be rocking the festival. Now If you’ve ever tried in the past, you know that if you wish to attend Coachella there is no time to lose when it comes to buying tickets. You need to jump on that yesterday. And with a lineup like this you know it’s going to be epic, not to mention all the surprise performers that will no doubt make an appearance. Indio CA, friends, music, you know the drill. K. Michelle Announces New Nationwide Tour!!! Atlantic recording artist K. Michelle has announced details of her upcoming, headlining tour, dubbed "My Twisted Mind Tour." The first leg (Part One) kicks off February 5th at San Francisco's Mezzanine and then travels through the month (see itinerary below). Additional dates will be unveiled soon -- for regularly updated news and information or to purchase tickets, please log on to www.thekmichelle.com/tour. 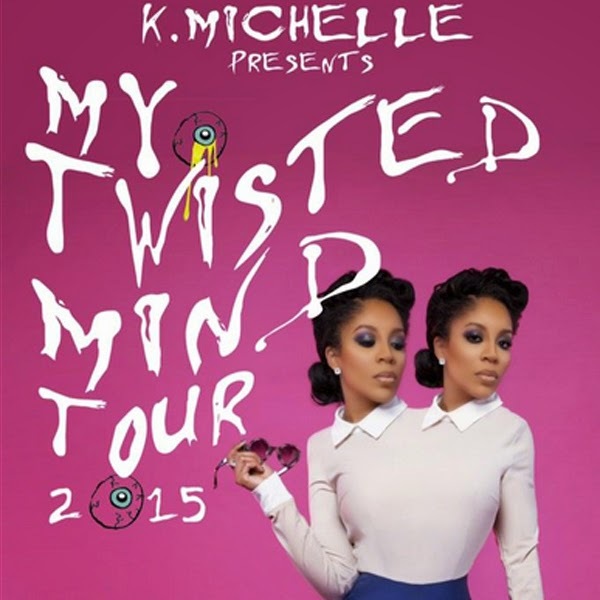 "My Twisted Mind Tour" celebrates K. Michelle's blockbuster new album, "ANYBODY WANNA BUY A HEART?," which made a historic chart debut upon release last month, entering at #6 on the SoundScan/Billboard 200 -- the year's highest charting debut from a female R&B artist. What's even more exciting, the album -- which includes the hit singles, "Love Em All," "Maybe I Should Call," and "Something About The Night" -- debuted at #2 on Billboard's "Top R&B/Hip Hop Albums" chart as well as at #1 on the iTunes Store's "Top R&B/Soul Albums" ranking.